When news broke in late December 2002 that the body of Dr. Laura's long-estranged mother, Yolanda Schlessinger, 77, was discovered decomposing (apparently for several months) in her Beverly Hills condo, the author and radio talk show host told her listeners that she deeply regretted never accomplishing a reconciliation. Dr. Laura, whose motto is "Go do the right thing," takes a lot of flack for her outspoken stances on social, religious and family value issues because some people find them completely outrageous or whenever she changes her mind about her points of view or is outed for not walking the talk. I enjoy Dr. Laura's show and have learned a lot from her books, and the fact that she's human makes her appealing to me. She's damned if she does, and damned if she doesn't a lot of times, but always, it seems to me, stays true to her own inner and sometimes fluctuating compass. How boring when people pretend to be perfect and their not, because who is? I don't agree with everything she says, but for the most part I think she gives good advice. That said, the epitaph for her mother, a perpetual reminder that doing the right thing isn't always the easiest path to take nor does it guarantee happy endings, really struck a chord with me when I first saw it. Yolanda's story developed amid drama and speculation. At first the police suspected that she was murdered, but the coroner eventually ruled, in April 2003, that she died from natural causes related to arteriosclerotic cardiovascular disease . Then there was the mix up as to who would be contacting whom about releasing the body after autopsy, resulting in Yolanda lingering in the morgue for ten days before being claimed. The biggest question raised by the media and public alike had to do with family dynamics. Why were this mother and her famous daughter on the outs and exactly how much effort was put into a reconciliation? Had Dr. Laura practiced what she preached? The day Dr. Laura briefly addressed her mother's death on-air, she revealed that her mother had shut the family out of her life for years. "I guess one of the reasons I am so clearly committed to the sanctity of the family and protection of children and the welfare of children in my books and on this radio program is quite frankly because I was not fortunate enough to grow up in a loving, close-knit family myself," she said. "My dad's dead, my mother ... they were divorced, and my mother and I have had a long estrangement, which was her choice, as it was her choice to be estranged from all the family." DR. RHODA MARCOVITCH, a psychologist who shared an office with Dr. Schlessinger in the days she and her mother were on speaking terms, yesterday offered a theory about Yolanda Schlessinger, whom friends called Londy. The event that set off the end of Dr. Schlessinger's relationship with her mother: the therapist firing Mom. The notion that Dr. Schlessinger abandoned her mother troubles Dr. Marcovitch. It was the mother, she said, who abandoned the child. Dr. Marcovitch said she tried to bring them together, but Yolanda Schlessinger was not willing. No matter what the truth is, it seems that people who hate Dr. Laura will continue to vilify her for this chapter of her life, and fans of the advice guru will support her whole-heartedly.That's the thing with Dr. Laura, there never seems to be any middle ground when it comes to discussing her approach to life. But that's exactly what I think should be done, taking a moment to examine the big picture theme here: the fact that navigating relationships -- family or otherwise -- can be damn difficult, even for the professionals, and that there are no guarantees for miracle cures to what ails the ties that bind. Sometimes things don't work out because people are on completely opposite pages and what is left is often regret. Today someone commented on the epitaph to me, "Laura had to get the last word, didn't she?" I don't see it that way. The definition of regret is "a sense of loss and longing for someone or something gone," "a feeling of disappointment or distress about something that one wishes could be different." Regret isn't a last word, it's hole in your heart. And, while revisiting this story, my heart goes out to both women. The fact that I'm writing this on my own mother's 78th birthday doesn't escape me. I'm grateful for the good relationship we share, but it hasn't always been easy. Part of the reason why I have been able to work issues out with my mom now and again is because of advice I've heard Dr. Laura give callers and followed. Although our rifts were never decades long, I can only image how each of us might feel if we lost the other while at odds. Keep trying to do the right thing, Dr. Laura. Back in January I reported here the sad story of local teenager Nataline Sarkisyan (1990-2007) who passed away while waiting for CIGNA to reconsider their rubber stamping of her liver transplant request. 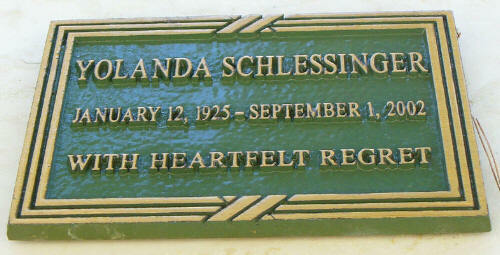 Today I revisited her gravesite at Forest Lawn Hollywood Hills and photographed her new headstone for Findagrave.com. It is a lovely tribute to a lovely young lady who died way too soon and under heartbreaking circumstances. Her family's plans for a lawsuit against the healthcare provider has been off the news radar in recent months. But two local musicians - ailment (Tony Barkodarian) and eye2eye (Mike Chakrian) - got some media exposure in the LA Times this week for their charity tribute song, "Nataline." "We didn't know Nataline personally, but I grew up in the same area and the whole story hit very close to home," says Barkodarian, a Northridge native who now lives in Glendale. "The best catchphrase I heard was 'murder by spreadsheet' -- that's exactly what it was." After Sarkisyan's death, Chakrian posted some lyrics on MySpace, and upon seeing them Barkodarian was inspired to write a beat. The pair got together and recorded a song, "Nataline," and have made it available for download. Proceeds from the download ($1.99) go to the Sarkisyan family. The song is heartfelt, political and gets right to the heart of what's wrong with our nation's healthcare industry, using Nataline's story, including audio from various press coverage of her death, to underscore the real price paid for her so-called medical benefits. To download the song (I did!) please visit my profile page where I've posted a link in the right-hand column. For less than two dollars and five minutes of your time, you can help Nataline's family and support a worthy cause spearheaded by two musicians who have hit just the right note. During the holidays we all witnessed the heart-breaking events unfolding at UCLA Medical Center as a beautiful young lady, Nataline Sarkysian, lost her battle with leukemia while cold-hearted Cigna HealthCare Insurance denied her approval for a critical liver transplant - deeming it "experimental" and therefore not something it covers. Every person in the United States who values their health and their life should be very afraid after seeing this. Here's hoping Nataline's family lawsuit against Cigna will help to institute some changes. The price they have paid to lead this battle is something no family should have to endure. Bless their hearts. 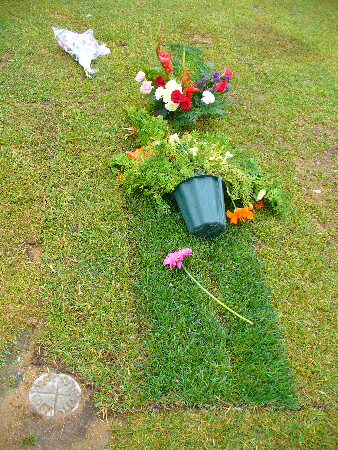 Please consider leaving a flower and note of support for her grieving family on the Findagrave.com memorial page that I created for her. 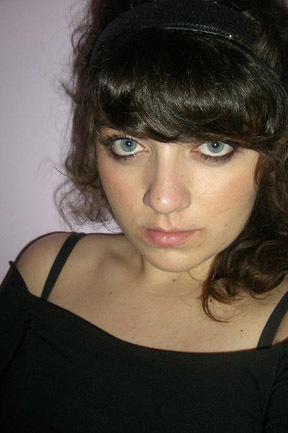 Read more about Nataline on her official website hosted by her family attorney, Mark Geragos.